Dark lips has been a growing concern especially for women as there is an existing stigma that people with dark lips and dark gums are smokers. Truth is, several factors affect the darkening of our lips. According to researchers, SouthEast Asians are more predisposed to darkening of the lips, though other causes may be congenital such as those who were born with dark lips, other acquire the darkening due to several factors such as cosmetic products like lipstick, hyper pigmentation due to sun exposure, smoking and drinking hot beverages like coffee and tea, and dehydration. Though there are natural ways to lighten the color of your lips, these remedies are not always effective especially if the cause is congenital or if the pigmentation is deep. Prof. Somyos Kunachak authored one of the researches regarding the more permanent and effective treatment to dark lips. The title of the study is “An effective treatment of dark lip by frequency-doubled Q-switched Nd:YAG laser” which was published in 2001. At Yoskarn Clinic, we had been using the treatment for years and we found that most of our patients are satisfied with the result. Dark Lips with congenital cause is however harder to address as recurrence is more frequent, patients are never the less satisfied that somehow, their lip concern is addressed and the treatment is working. We also offer a lip balm with sun protection, Vit C, moisturizing cream and other minerals, which protects the lips from the sun without leaving any residue on the lip skin which makes it darker. The lip balm is also especially formulated by our trusted dermatologists so it is hypoallergenic. Patients who had undergone laser treatment are advised to avoid the sun in a minimum of 1 week after treatment to avoid further darkening. Pigmentation may result from laser treatment but this is quite rare in our experience with the lips. Lip balms and lipsticks with natural minerals and SPF are recommended for added protection. Usually, for laser treatments, it will only take 1 session before a desired result is achieved. 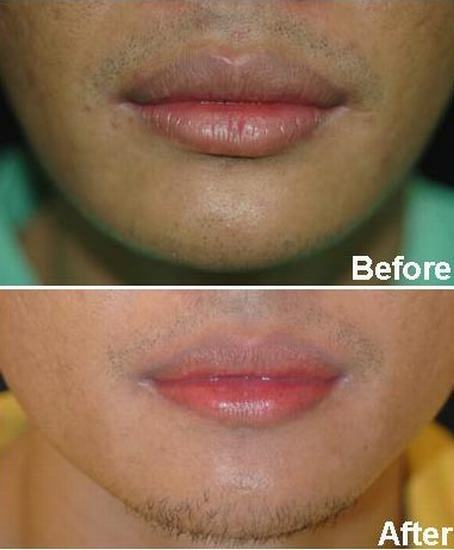 Like all other laser treatments however, response from patient to patient may be different but most of our patients are satisfied with the result as their lips turn naturally pink. Patients with congenital cause for lip darkening may however need more sessions and recurrence is more frequent. Dark lips has been a growing concern especially for women as there is an existing stigma that people with dark lips and dark gums are smokers.